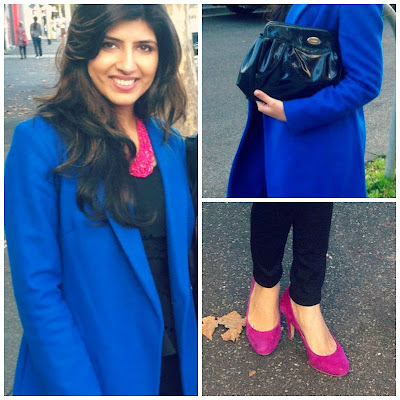 Here's introducing my sister, Asra Khan, another fashionista in the family. She has been one source of inspiration growing up when it came to fashion and dressing up. I would always try to steal her clothes and get screwed for it too, but trust me it was all worth it. I have learnt much from her while she'd get dressed and I'd just stare trying to comprehend the little i could at that point. 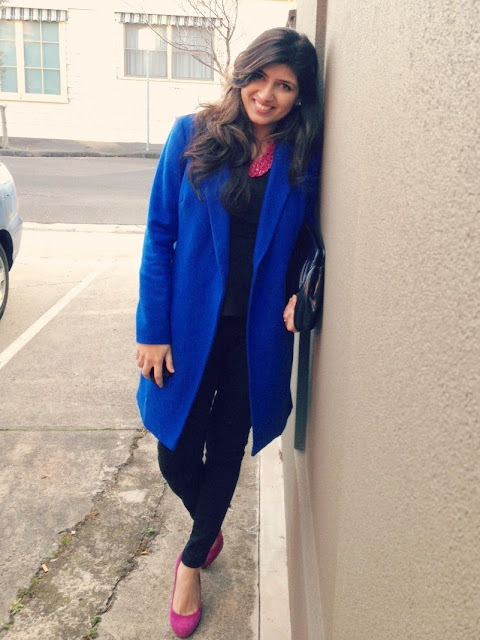 Currently residing in Melbourne, Australia, she has decided to contribute to my blog. So expect more posts from her from now on. In this outfit, the Blue Overcoat is the main beauty. The chilly Aussie weather calls for thick, warm coats. She has colour blocked her outfit with a Purple Necklace and Pumps. And finally completed the look with an Over-sized Clutch.